My latest obsession is everything Chevron. No, not like the gas station, but the zig-zag inspired print. The brand decided to create a line exclusively for Target stores much like other brands have done; brands like William Rast (Justin Timberlake's company), Jean Paul Gaultier, and McQ Alexander McQueen. Unlike most of the general public, and those waiting in line for the brand, I was not very amused by the Target venture. To be honest, I'm not a huge Missoni fan to begin with but then oversaturating the general public with heaps of the zig zag print, not to mention an immense amount of commercials being thrown our way, I just wansn't on board with the whole thing. This adorable dresser with the chevron pattern painted on top, it actually looks like it might be two nightstands used side-by-side to give the dresser effect. love. 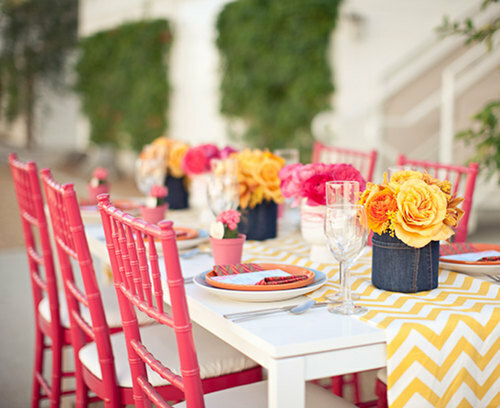 A punch of color and chevron print to match. I'm dying for this. Now, to just find an occasion to recreate this look... Good thing October is the "Month of a Million Birthdays" as I like to call it. This is one of my absolute favorites. It's a mix of pretty much all my favorite colors (as you can probably tell from my blog layout). Haha. It pretty much is my blog layout in a room. I love it. And I love the the soft grey color doesnt make the chevron pattern make you dizzy or anything like it could in a brighter color. And lastly, yet again, a mix of all my favorites. I have a love of all things eclectic. This room is so wonderfully eclectic it makes me giddy. With Danica moving out very shortly, I feel like I should take this opportunity to do some redecorating. I'd like to change my room around a bit and definitely do an overhaul on my garage turned craft room. If/when I tackle these projects, don't be surprised if you see some chevron sprinkled throughout.